The Butterworth Bus Terminal (Stesen Bas Butterworth) is ideally located just a short walk to the ferry terminal, where you can catch the boat over to the UNESCO World Heritage City of George Town on Penang Island. It is also just a few minutes walk to the new Butterworth Railway Station (all part of the new Penang Sentral transportation hub which is now open). In our opinion, it is the best and easiest place to catch a bus to if you are planning to go to Penang Island, as the ferry ride only takes only 15 minutes to cross over to the island and you end up at the jetty in George Town which is right on the edge of the old part of the city, where most of the accommodation is located. To get to the ferry jetty, just follow the signs inside the Penang Sentral building. One thing to be aware of - make sure your bus plans to get here well before the last ferry over to the island! Compare this to arriving at the other bus station on Penang Island, Sungai Nibong Bus Terminal, which is located past the Penang Bridge, quite some distance from the main tourist area of the city and requiring a 20 - 30 minute bus ride (depending on traffic) or an expensive taxi to get in to town. 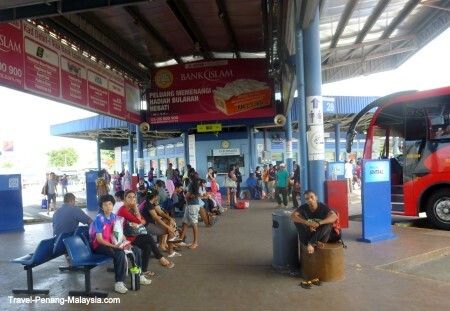 Butterworth Bus Terminal is also a much busier bus station than Sungai Nibong, with buses leaving to all places in Peninsular Malaysia, whereas Sg. Nibong deals mainly with more long distance buses. There are many ticket counters here and it can be a bit confusing when you first arrive. Usually as soon as you arrive people will come up to you asking where you are going and lead you off to the ticket counter, or if you need help you can head to the information counter. Also another factor why Butterworth is the best place to get a bus to and from (rather than Sungai Nibong bus station on the island), is that it is slightly cheaper as the distance travelled is shorter and coaches do not have to pay the toll to cross over the Penang Bridge. There are literally hundreds of places in George Town that you can buy bus tickets from, with travel agents, hotels and guest houses, some money changers and travellers cafes all selling tickets. 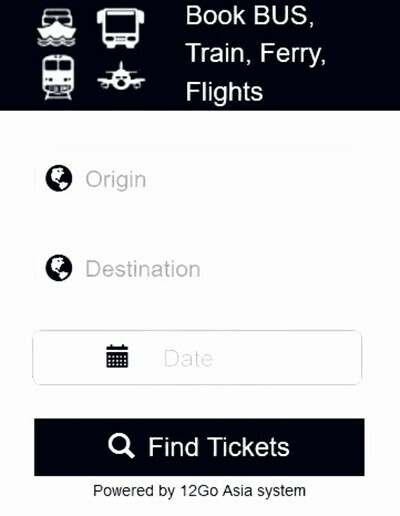 They will all add a commission for their services, so you will find bus tickets sold cheaper online. For shorter bus trips to nearby towns one or two hours away, you can usually just turn up at Butterworth and jump on the next bus (unless it is a Malaysian public holiday / long weekend) - For long distance buses, we recommend you book these in advance, as departure are less frequent and buses tend to be sold out much quicker.